Hello Linux Geeksters. 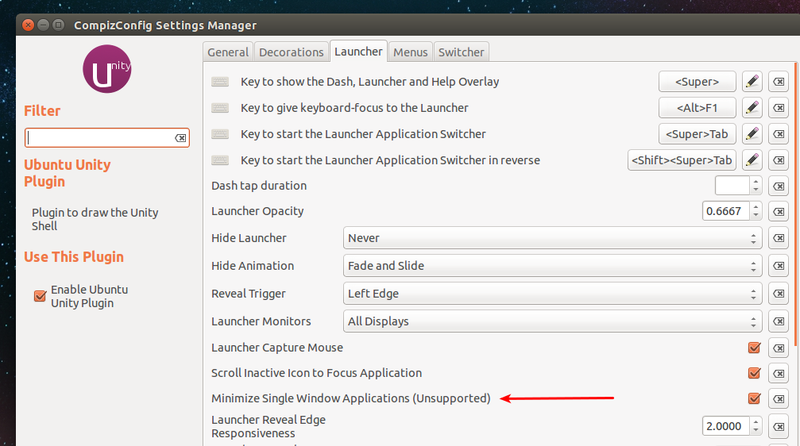 As you may know, Ubuntu 14.04 Trusty Tahr got a very requested feature that enables the users to minimize applications by clicking on the Launcher Icon. To get this new feature, you have to install the compizconfig-settings-manager package first. As a reminder, Ubuntu 14.04 Trusty Tahr will be released on the 17th of April, coming with a lot if interesting new features, including: locally integrated menus (a feature also present on GNOME 3.12), improved shutdown dialogs, a new feature that allows the users to increase the volume up to 200%, a rewritten Unity 7 with support for window filtering by title, Unity Control Center as a replacement for GNOME Control Center, and of course, a new default wallpaper and 11 other pretty wallpapers submitted and voted by the community. Also, the Login Screen and the Lock Screen have been made to look identical.